Del Webb - The Woodlands is a new 55+ community in the Houston, Texas area. 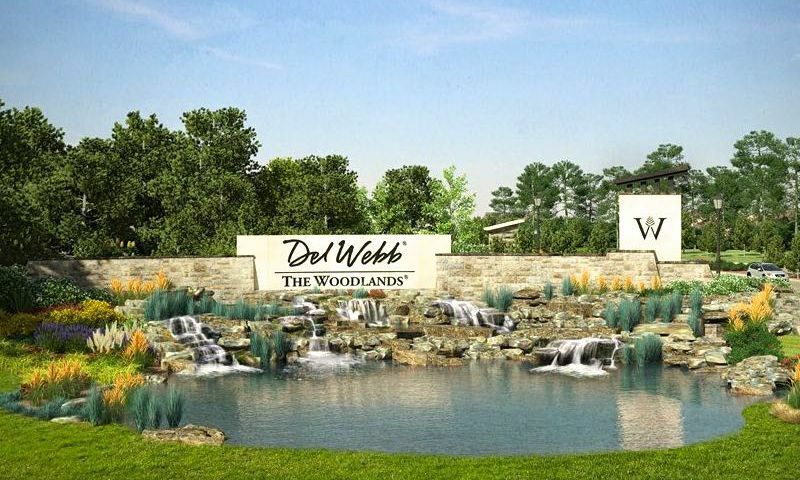 This active adult neighborhood will bring Del Webb's signature retirement living to the highly coveted city of The Woodlands. This city is experiencing rapid growth and has a nearly endless number of restaurants, shopping areas, and performance venues, providing all the entertainment of nearby Houston without the congestion and traffic. Upon completion, this 55+ enclave will have approximately 550 single-family homes with a bustling clubhouse at its center, where homeowners will gather with neighbors and meet new friends. The community will have a clubhouse that will boast 11,500 square feet of indoor amenity space. It will feature a fitness center for staying in shape as well as a card room, meeting rooms, and an arts and crafts studio for picking up a new hobby or joining a group with neighbors. For socializing with friends, there will be a social lounge, ballroom, billiards room, catering kitchen, and coffee bar. There will also be plenty of ways to take full advantage of the beautiful Texas climate with an outdoor pool, spa, and patio. Homeowners will also be able to compete on pickleball and bocce ball courts. Two tennis courts will be available for a quick game with friends. Outdoor events and games will take place on the activity lawn. Walking and biking trails will weave throughout scenic parks, creating the perfect backdrop for early morning jogs. There will be two home series within this 55+ community. The Classic Series is comprised of some of Del Webb's most popular models. These homes range in size from 1,711 to 1,960 square feet and will have two or three bedrooms, two or three bathrooms, and an attached two or two-and-a-half-car garage. The Estate Series will offer more spacious homes that will have 2,327 to 2,604 square feet of living space with two or three bedrooms, two to three bathrooms, and an attached two or two-and-a-half-car garage. Del Webb's home designs provide architectural consistency throughout the community while allowing for modifications to make each home unique. These homes will offer open island kitchens, flex rooms, and optional mini-suites. True to Del Webb's reputation, this 55+ community near Houston will offer plenty of activities to keep homeowners socially and physically active. A full-time activities director will continuously plan fun events for neighbors to become fast friends. The neighborhood will also have several activities to keep residents busy once the clubhouse is complete like arts and crafts, card games, billiards, bocce ball, and pickleball. The monthly fee will cover amenities and yard maintenance, allowing more free time for everyone. Just down the street from this active adult community are several shopping centers that provide grocery stores, restaurants, banks, a Walgreens, Home Depot, and Target. Interstate 45 is only a couple of minutes away, providing easy access to the surrounding area. Three miles away is the Montgomery County Medical Center. George Bush Intercontinental Airport is less than 40 miles from the community. The Woodlands is one of the most sought-after master-planned communities in the country, featuring outdoor pavilions, restaurants, bars, retail stores, and even a nature preserve. Golfers will love having three courses, including two Jack Nicklaus designed courses, right outside of the community. If big-city entertainment is on the agenda, then Houston and its world-class attractions are only 40 miles to the south. Del Webb - The Woodlands will provide dynamic active adult living near Houston, Texas. Clubhouse - 11,500 Sq. Ft. - Coming Soon! There are plenty of activities available in Del Webb - The Woodlands. Here is a sample of some of the clubs, activities and classes offered here. The Classic Series brings some of Del Webb's most popular floor plans to Del Webb - The Woodlands. These homes range in size from 1,711 to 1,960 square feet and offer two or three bedrooms, two or three bathrooms, and an attached two or two-and-a-half-car garage. The Estate Series is Del Webb's more luxuriously sized homes. These residences range in size from 2,327 to 2,604 square feet and offer two to three bedrooms, two to three-and-a-half bathrooms, and an attached two or two-and-a-half-car garage. 55places.com is not affiliated with the developer(s) or homeowners association of Del Webb - The Woodlands. The information you submit is distributed to a 55places.com Partner Agent, who is a licensed real estate agent. The information regarding Del Webb - The Woodlands has not been verified or approved by the developer or homeowners association. Please verify all information prior to purchasing. 55places.com is not responsible for any errors regarding the information displayed on this website.